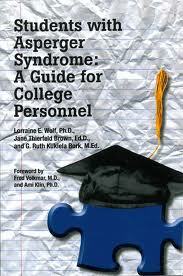 Students with Asperger Syndrome: A guide for College Personnel by Lorraine E. Wolf, Ph.D., Lorraine E. Wolf Jane Thierfeld Brown, Ed.D., and Ruth Bork, M.Ed . Students with Asperger Syndrome often have trouble with social skills and self-regulatory behaviors in college, and disability professionals are often not used to reaching out to students in this way. This provides strategies and accommodations for professionals to use to help support these students. Major chapters address legal issues and academic accommodations; co-curricular needs and accommodations; housing and resident life; faculty issues; other partners on campus such as business and academic affairs, campus police and public safety; employment issues; working with parents, and more. Checklists, forms and other tools help guide and structure the combined efforts to help students succeed. Pp. 337. This entry was posted in Adolescent/Transition Issues, Our Library and tagged adolescent, college, transition. Bookmark the permalink.